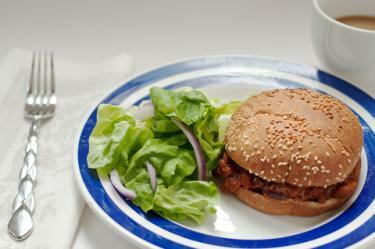 Thanks to textured vegetable protein (TVP), you can create a nutritious, meatless meal. Whether you're new to cooking with TVP or experienced working with this meat substitute, the following recipes will help you prepare a variety of delicious dishes. Slightly chewy, yet still tender, these cutlets are bound to be a hit at the dinner table. In a small saucepan, bring the vegetable broth to a boil. In a medium bowl, combine the TVP, bread crumbs, garlic, salt and pepper, and stir well. Pour in 1 cup of the broth, and mix well until the liquid is absorbed. Add the VWG and remaining 1/4 cup of broth, and mix until you can see strands of gluten begin to form. Shape the mixture into four separate cutlets. 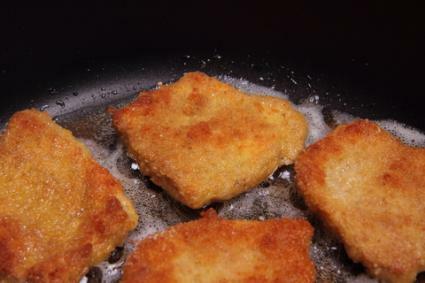 In a large skillet, fry the cutlets on one side until they're crispy, and then and repeat, making sure each cutlet reaches an internal temperature of 160 degrees. Serve with mashed potatoes, gravy and your favorite vegetable. TVP really soaks of the spicy flavor of curry in this dish. Marinate the TVP in the tamari sauce for 15 minutes to reconstitute and season. Add curry paste, and fry for 1 minute. Add 1/4 cup coconut milk, TVP, peppers, carrots, and zucchini, and simmer for 5 minutes. 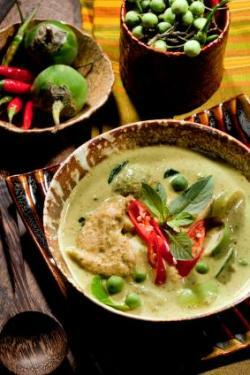 Add the remaining coconut milk, and simmer until vegetables are tender. Add the peas and bean sprouts. Cook for 5 to 10 minutes. 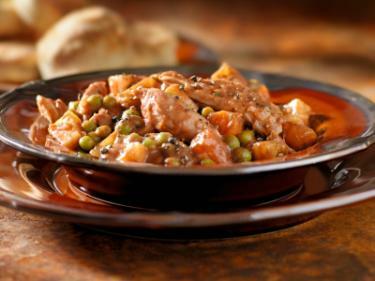 Stew makes the perfect meal any time there's a chill in the air. Heat one cup of the vegetable broth in the microwave until it just begins to boil. In a medium size bowl, combine the TVP and broth, and let it sit for approximately 15 minutes to reconstitute. In a large soup pot, saute the onion, celery and garlic in the olive oil until the onions begin to turn translucent. Add the TVP to the pot, and cook for 4 minutes, stirring occasionally. Add the vegetable broth, along with the Worcestershire sauce, wine, bay leaves, salt, and pepper. Let the soup simmer for approximately 1 hour. Stir in the tomatoes, peas, chopped carrots and potatoes, and simmer for another 30 minutes. In a small bowl, combine the cornstarch and water mixture, and whisk to make a smooth slurry. Pour the slurry into the stew, stirring constantly so it's well blended. Continue to simmer for another 5 to 10 minutes so the stew thickens. Serve with biscuits or some hearty wheat bread. Craving a Sloppy Joe? No problem. The sandwich tastes like the real deal. In a small saucepan, bring the 1 1/2 cups of water to a boil, and then turn off the heat. Add the TVP to pan, and give it about 15 minutes to reconstitute. Add the chopped onion, green pepper and minced garlic to the pan, and saute until the onion begins to turn translucent. Add the TVP to the pan, and stir. Add the tomato paste, 1/2 cup water, ketchup, Worcester, oregano, salt and pepper, and stir until combined well. Bring the mixture to a boil for 2 minutes, stirring constantly and then turn off the heat. Serve on your choice of bread or roll. This dish is as attractive as it is tasty. 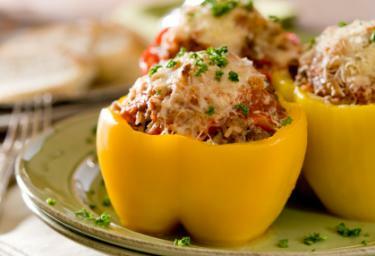 Use a mix of red, green orange and yellow bell peppers for a colorful presentation. In a medium size bowl, combine the TVP and broth, stir and set aside until the liquid is absorbed. Cut the tops off the peppers, core them and rinse. Bring a large stock pot of water to a boil, and cook the peppers for 5 minutes. After 5 minutes, remove the peppers from the water, drain them, and arrange them upright in a baking dish. In a frying pan, saute the onion in the olive oil. When the onions are almost translucent, add the garlic to the pan and continue cooking until the garlic is warmed through. Add the TVP, rice, parsley, oregano, salt and half of the tomato sauce to the onions and garlic, and stir well. Stuff each pepper with the mixture, and pour the rest of the sauce over peppers. Cover the dish with foil, and bake for 1 hour, or until the peppers are tender and the center of the stuffing is 160 degrees. Remove the foil,and sprinkle the peppers with mozzarella. Return the dish to the oven, and continue baking just long enough to melt the cheese. Serve the peppers with a garden salad. Think of these recipes as a starting point, and don't be afraid to make them your own. If you want more TVP, go ahead and add it; just make sure you reconstitute it at about a 1:1 ratio with your chosen liquid. Play around with your seasonings until you find just the right flavor combination. The entire point is to create dishes you love and want to prepare again and again!